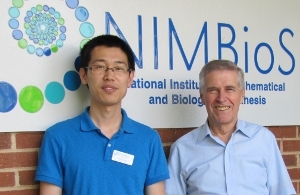 KNOXVILLE - National Institute for Mathematical and Biological Synthesis postdoctoral fellow Jiang Jiang and University of Miami ecologist Don DeAngelis have won the 2014 best paper award from the Ecological Society of America for their theoretical paper on the ecological linkages between organisms and their environment. In a mathematical model, Jiang and DeAngelis illustrate what happens when "ecological engineers" or species modify the environment to their own benefit and how this affects the diversity of the competitive community that they inhabit. "These novel results are likely to foster further theoretical research and generate some fine hypotheses that will motivate experimental and field studies," said Bruce Kendall, chair of the ESA's Theoretical Ecology Section which made the award. "Strong species-environment feedback shapes plant community assembly along environmental gradients" was published online in October 2013 in the open access journal Ecology and Evolution.